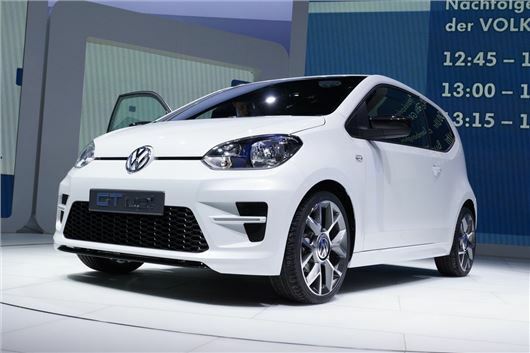 Volkswagen has confirmed that the Up GT will go on sale in the UK this year. The sporty version of Volkswagen's small hatch was originally seen as a concept car in 2011 and while prototypes have been seen testing, rumours were that it had been canned due to budget constraints. However, the good news is that it's set to arrive here by the end of the year. Seen as the spiritual successor to the Lupo GTI, the Up GT is powered by the same 1.0-litre three-cylinder engine as the rest of the range, but with power boosted to 110PS. Currently the most powerful Up develops 75PS. It also gets a six-speed manual as oppose to the five-speed gearbox currently in the standard Up. Thanks to the tweaked turbocharger, the Up GT should feel very sprightly helped by a low kerbweight of less than 1000kg. It will get uprated brakes with discs all round replacing the rear drums on the standard car. The suspension set-up will be based on the current sports suspension package which has a 15mm lower ride height and different springs. Bespoke 16-inch alloys will also be standard. In terms of styling there are new bumpers and a rear diffuser although the dual exhausts of the concept are unlikely to be on the production model. It will also get front LED daytime running lights currently only seen on the new e-Up. Performance figures haven't been revealed but a 0-62mph time of around 8.5 seconds is expected along with strong economy of more than 55mpg and low CO2 emissions. There's no word on price yet but as the top model in the Up range (aside from the e-Up) you can expect it to cost around £14,500. Meanwhile 2014 looks like another busy year for Volkswagen. The firm will debut the revised Polo at the Geneva Motor Show next month. There will be no radical change in the styling but there are updates to trim specifications and cleaner engines too. Later in the year we'll see a facelifted Scirocco and the unveiling of an all-new Passat. Volkswagen say it will have a more radical design than the rather conservative look of the current model.